The collapse of an unlicensed gold mine in Indonesia this month is renewing attention on illegal mining in the country, which authorities say often overlooks safety, health and security requirements. 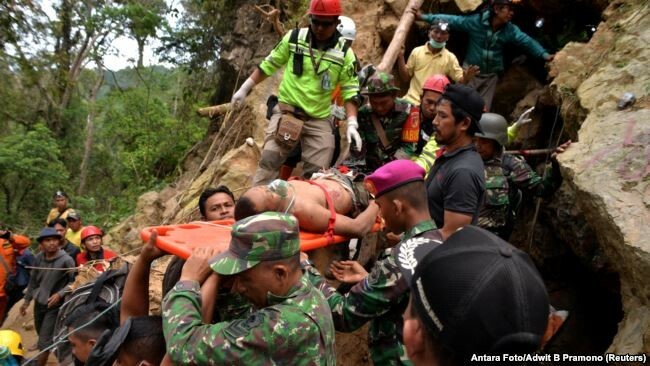 Indonesian rescue teams managed to evacuate 34 victims of a collapsed and unlicensed gold mine in North Sulawesi March 6, but only 18 of them survived. The authorities believed there are still dozens trapped inside the mine, located on a steep hillside in Bolang Mongondow Regency. The accident happened at the end of February when the wooden beams that support the mine broke causing the soil to shift. In the same area in North Sulawesi, in June 2018, another illegal gold mine collapsed, killing six people. Two weeks after that, another accident occurred in a mine in West Lombok. Thirteen gold miners died of carbon monoxide poisoning. Sri Raharjo, the director of engineering and environment of mineral and coal at the Ministry of Energy and Mineral Resources, says illegal mining can create lethal hazards. “The potential for accidents is great. For example, underground mining must use beams that are sturdy with certain measurements. But in the case of the collapsed mine, they only use the beams at the entrance,” he told VOA. According to data by the Ministry of Environment and Forestry, there are 8,663 unlicensed mines in 352 locations in Indonesia, covering a total of 500,000 hectares. About 25 percent of them are gold mines. Erwiza Erman, a senior researcher at the Indonesian Institute of Science, says illegal mining is usually a small-scale operation managed by the local community or people. She said the procedure to get a mining license is complicated for small-scale miners. “Mostly it takes a long time, it could be years to wait for the license. The problem is not that the people don’t want to legalize the mine,” she said. The government can issue a Community Mining License, or IPR, which requires miners to abide by good mining practices while the local government supervises the operation to ensure safety. Raharjo said the process to get a license takes about 14 working days. “That’s usually how long it takes for most permits, to make it easier. But of course there are requirements, and we need to do a survey first to identify whether the mine really has mineral or coal reserve and how much. After that, we can issue the IPR,” he explained. Rescue workers carry a body bag containing a victim following the collapse of an illegal gold mine at Bolaang Mongondow regency in North Sulawesi, Indonesia, Feb. 26, 2019. But he admits the survey might take time and if there is not enough reserve in the mine, the government cannot grant the license. “The problem is if there is only very little reserve and the mine runs out of resources, most of the time people will just move,” he said referring to the process of restoring the area that has been mined. Erman believes the regulation on community mining must be improved because there is no comprehensive law on different commodities. Raharjo said it is difficult to determine how much money the government is losing because of illegal mining over unpaid taxes and royalties. “But to give an example, in one illegal mine that spans 10 hectares located inside a concession area, the amount of gold production is 1,600 kilograms a year. If we do the math, the potential of financial loss is around $12 million, that is only from one place,” he added. Meanwhile, Karliansyah, the director general for pollution and environmental damage control at the Ministry of Environment and Forestry, said illegal mines can potentially harm the surrounding environment because there is no reclamation plan after mining. “The ministry has to do reclamation on soil that is already polluted because of illegal mining, which usually uses cyanide and mercury,” he said. In dealing with the issue, the Ministry of Environment and Forestry has allocated $20 million (Rp 290 billion) out of the state budget in 2018. But with it, the ministry can only perform two to three small-scale reclamation projects every year. FILE - Rescue team members carry the body of a miner after a landslide hit Srumbung Village in Magelang, Indonesia, Dec. 18, 2017. Raharjo said the government is working on closing many of the unlicensed mines in Indonesia. “But it’s an uphill battle, because if we close it then a few weeks later they will mine again or move to a new spot,” he said. But Erman is unsure that closing the mine is the best solution for the problem. “How can you close it if there is no economic alternative for them? There is no subsidy for their basic needs, and they see the opportunities in front of their eyes. They would think, why not,” she added. According to Erman, the government should work with big mining companies and provide training as well as raise awareness to the small-scale miners on mining safety and protection of the environment. “It’s a task for the government, give them direction to create safety,” she said.